Read Sneha Madhavan-Reese's "Challenger Deep" from our Winter 2019 issue! As a literary journal housed in Fredericton, we at The Fiddlehead were moved when we received a poem from Deputy Sheriff Jason Henderson in the wake of the shooting on August 10th in our city. “The Wolf Hunter” is written in honour of law enforcement and is dedicated to Cst Robb Costello and Cst. Sara Burns of the Fredericton Police Force, both of whom were murdered that day along with citizens Donnie Robichaud and Bobbie-Lee Wright. We wish strength to everyone affected by these deaths. who would sit in them were put away long ago. to pass the piss-test, close the factory down. to one another every moment of our lives. 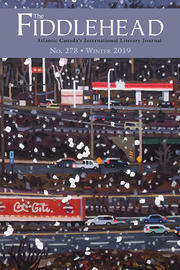 "The Day After the Best Before"
Matthew Hollett’s poem “The Day After the Best Before” has won The Fiddlehead’s 2018 Literary Contest Ralph Gustafson Prize for Best Poem. This interview was conducted over e-mail by Editorial Assistant Colin Johnson in the first weeks of March 2018 and has been edited for clarity. The New Brunswick Book Awards ceremony was held at Memorial Hall at the University of New Brunswick, Fredericton on May 24th. It was a wonderful ceremony with music provided by Jane Simpson and Gerard Collins. Colleen Kitts-Goguen emceed the event and David Adams Richards provided an inspiring and moving keynote speech.